Dedicated is a wonderful, free resource for church leaders and parents. It enables you to bless children living in poverty around the world, as you dedicate a child in your church. 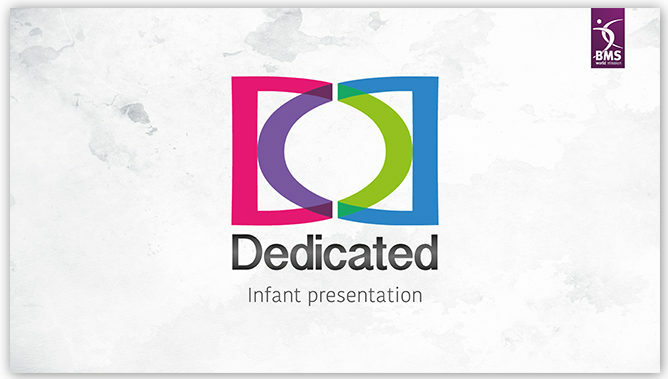 Dedicated is designed to help you plan and organise a dedication (or infant presentation or thanksgiving) moment in your church. 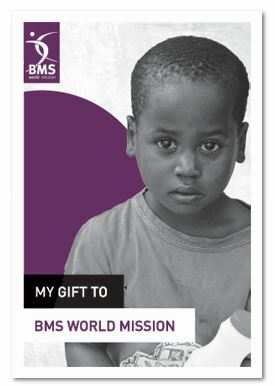 It also offers an optional opportunity to make a donation towards BMS World Mission work among families who struggle to provide for their children. You will find everything you need to hold a dedication service in your church in the Dedicated resource pack. We know that infant presentations and dedications are really special moments in church life. Dedicated aims to help you make your dedication services even more special – for the child, their family, and the wider church – by sharing the moment with families in need around the world. We hope you find Dedicated really helpful. General gift envelopes for donations in your church. These envelopes include the Gift Aid option, which adds an additional 25p in the £ to your giving, at no extra cost to you. Everything you might need for a service of thanksgiving, infant presentation or dedication of a baby is contained in this pack. The dedication (some people call it the presentation) of a baby in church is a beautiful moment. Dedicated is a resource to make that moment even more meaningful, by giving family and friends the opportunity to help less fortunate children around the world have a better life. The dedication (some people call it infant presentation) of a baby in church is a beautiful moment. Dedicated is a resource to make that moment even more meaningful, by giving family and friends the opportunity to help less fortunate children around the world have a better life. 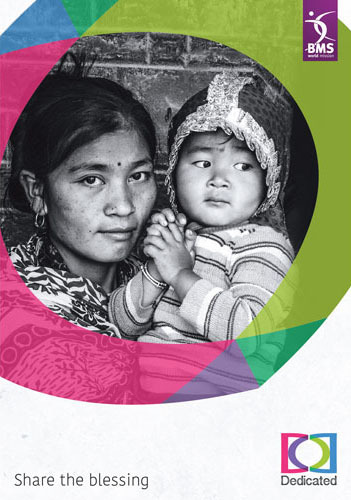 Use this inspiring leaflet to help parents understand the opportunity to give a gift. The dedication (some people call it the presentation) of a baby in church is a beautiful moment. Dedicated is a resource to make that moment even more meaningful, by giving family and friends the opportunity to help less fortunate children around the world have a better life. Use this helpful leaflet for parents to help explain what a dedication is all about. 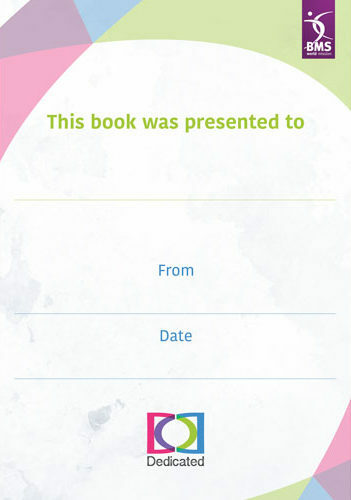 Use this bible/book faceplate, as part of the Dedicated resource, to help make a dedication (some people call it an infant presentation) simple, easy and life-transforming for children around the world. 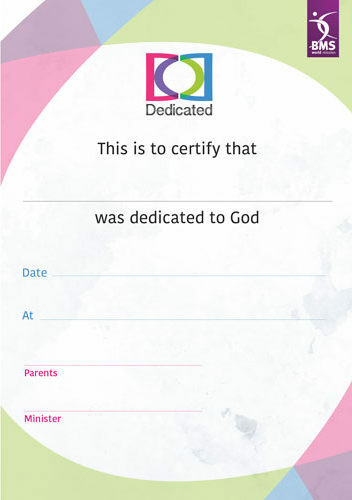 Use this certificate, as part of the Dedicated resource, to help make a dedication (some people call it an infant presentation) simple, easy and life-transforming for children around the world. 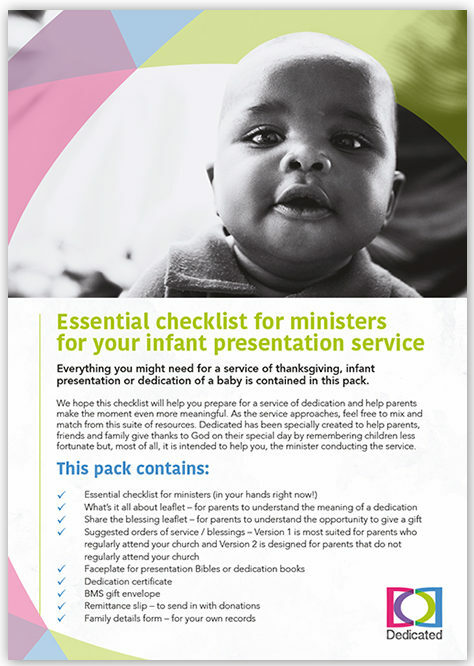 Use this checklist for ministers, as part of the Dedicated resource, to help make a dedication (some people call it an infant presentation) simple, easy and life-transforming for children around the world. 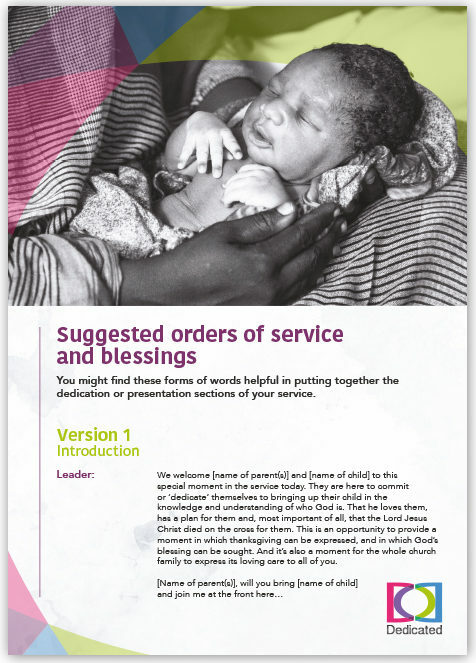 We have specially written orders of service, as part of the Dedicated resource, to help make a dedication (some people call it an infant presentation) simple, easy and life-transforming for children around the world. Version one is most suited for parents who regularly attend your church. 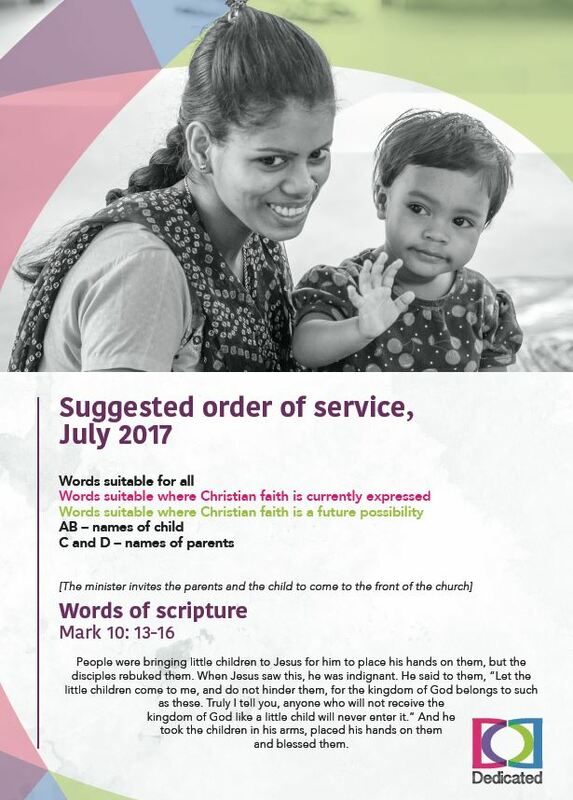 We have specially written orders of service, as part of the Dedicated resource, to help make a dedication (some people call it an infant presentation) simple, easy and life-transforming for children around the world. Version two is most suited for parents that do not regularly attend your church. Please download and complete the remittance slip when sending a gift in response to Dedicated. 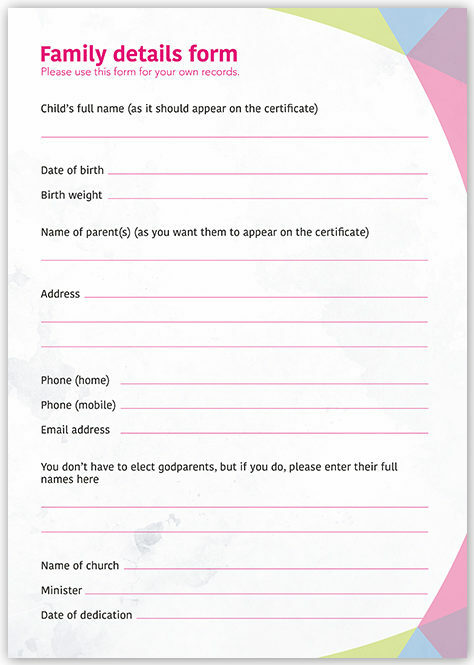 Use this family details form, as part of the Dedicated resource, to help make a dedication (some people call it an infant presentation) simple, easy and life-transforming for children around the world. Use this PowerPoint, as part of the Dedicated resource, to help make a dedication (some people call it an infant presentation) simple, easy and life-transforming for children around the world. We have specially written orders of service, as part of the Dedicated resource, to help make a dedication (some people call it an infant presentation) simple, easy and life-transforming for children around the world. Version three an updated order of service with new prayers and blessings. The dedication (some people call it the presentation) of a baby in church is a beautiful moment. Dedicated is a resource to make that moment even more meaningful, by giving family and friends the opportunity to help less fortunate children around the world have a better life. 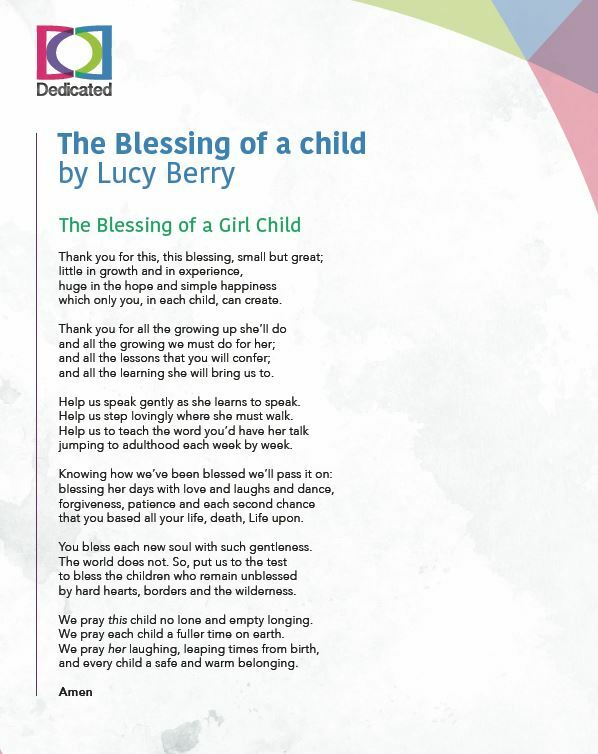 Lucy Berry has specially written a poem when using Dedication in your church. There are two versions of the poem one for boys and one for girls.